Yesterday was a day that I definitely wanted to stay indoors. Outside we had torrential rain and strong gusty winds. Even though the air was humid and warm it put me in the mood for a hot soup for dinner. 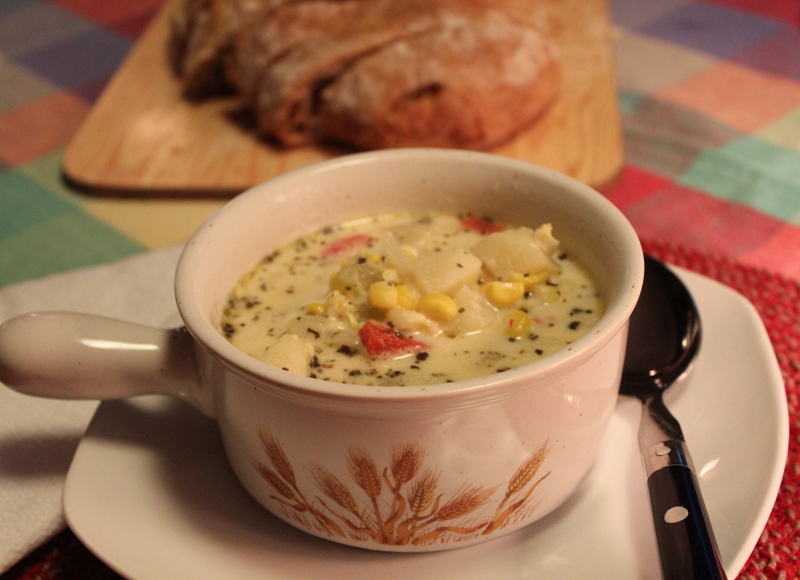 Remembering the corn I had cut from cobs and froze, I decided to make a corn chowder. 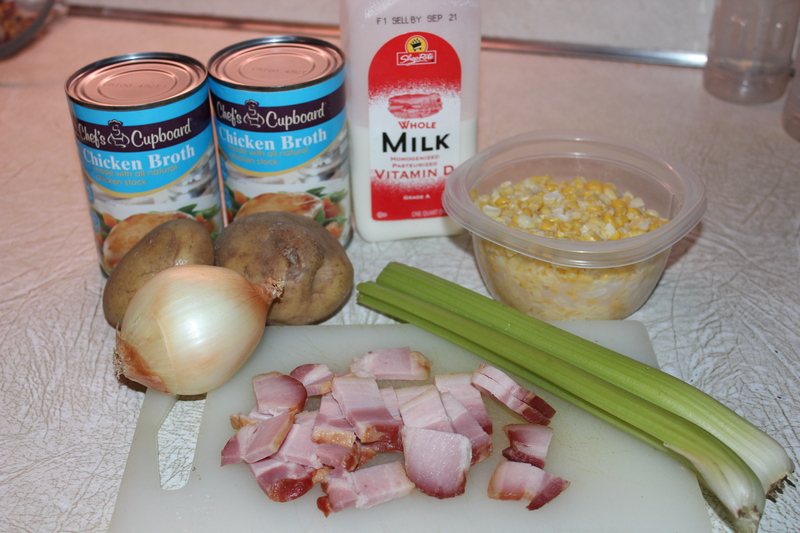 There are any number of recipes out there for corn chowder, and I have tried several, but the one I keep coming back to is this one which includes bacon. I like the smokiness it adds, and the bits of color in the finished soup. This version also includes potatoes, and they make it a bit more hearty, especially if served for a dinner meal. This could easily become a vegetarian meal by omitting the bacon and using a vegetable broth instead of chicken broth. Ingredients for Chowder. One can of chicken broth, not two. 1. In a large saucepan, cook bacon till crisp. Remove to paper towels to drain. Reserve bacon drippings in pan. 2. 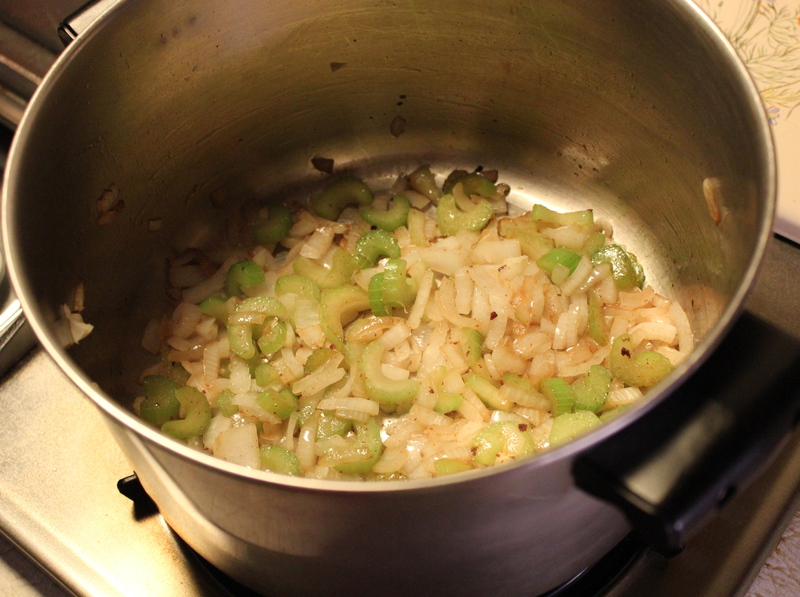 Add onion, celery and pepper to saucepan. Sauté over medium heat until golden, about 5 minutes. (I didn’t have any peppers so I added some roasted red pepper at the end with the corn). Add broth, water and potatoes, salt, pepper, basil, and bay leaf. 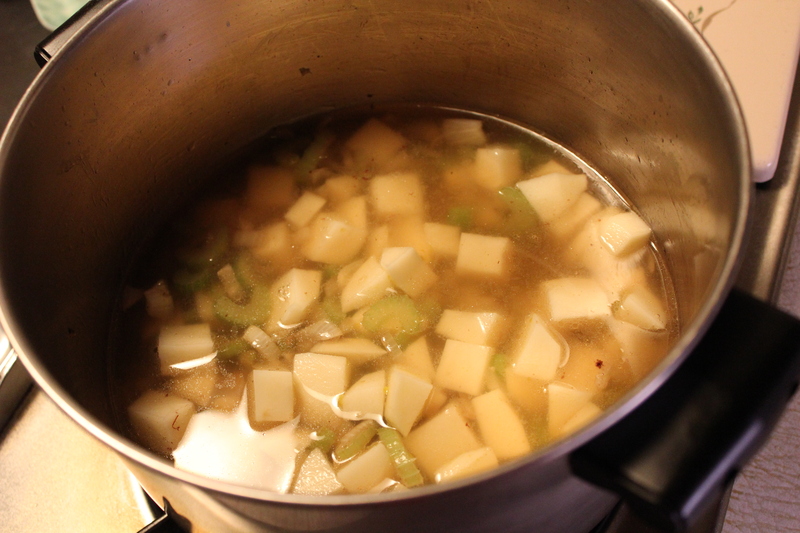 Bring to a boil; reduce heat, and simmer covered 10-15 minutes or just until potato is tender. 3. Stir in milk, corn, and bacon; return to a simmer, stirring occasionally and cook just to warm through. Do not allow to boil. Prior to serving sprinkle in chopped parsley if using. 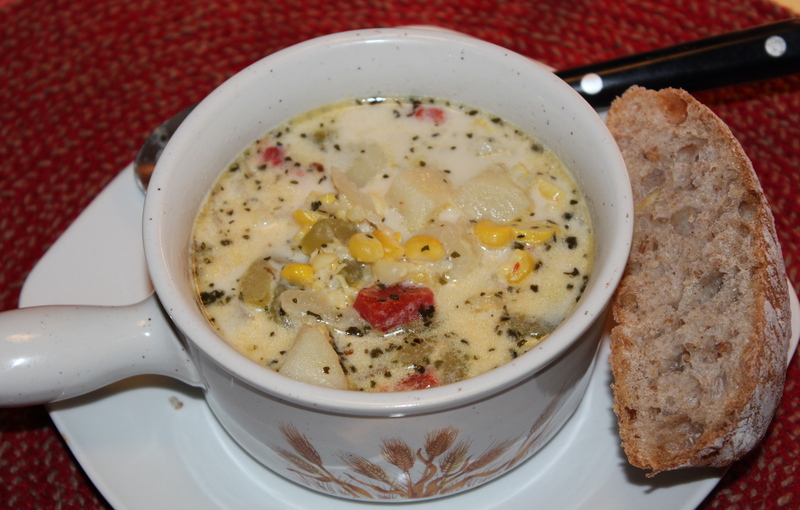 Corn Chowder and Rustic Whole Grain Bread: True Comfort Food. When I haven’t made this chowder in a while I forget how good it is, but one taste is all it takes to make me know how much I love it, and why this is the one recipe I make over and over. I’m so happy to share it with you. You must make it on a damp chilly day and serve it with a hearty loaf of rustic bread. True comfort food! SOURCE: This clipping has been in my recipe box for ages. I don’t know it’s origins. mmm.. I love corn chowder this time of year. I’ll have to make up a batch for work lunches soon. ← Time to Make the Doughnuts!